Why Are Police and Others Redefining "Home Security"? An intruder can be in your home in less than 10 seconds. Your home alarm simply tells you the he is inside. Guns are your last line of defense. This video was produced by an alarm company, that set out to show us how they could make Door Armor fail. We did not make this video! $500 Lifetime Guarantee against kick-ins - If a resident leaves, due to a kick-in, we will pay you up to $500. What Protects Your Family, When You're Not Home? You have an alarm, you own guns and you are sure that your home is secure. The simple fact is that it takes less than 10 seconds for an intruder to kick in a door and guns don't do much good if you are not home. While you might believe that home invasions only happen on "that" side of town, the fact is that crime happens everywhere. More than 75% of our customers live in rural and suburban areas. How Does Door Armor Work? Door Armor works before intruders enter and it never needs to be armed or maintained. When you lock your door, it's working. What About Your Alarm System? This video was actually produced by a customer. He does a good job of explaining installation and unboxing of the product so we feel like this is the best, most honest representation of installing Door Armor. ITS Tactical founder Bryan Black became a big fan or Armor Concepts and Door Armor after testing our products for himself. We don't expect anyone to take our word that our products work. We prefer to let our customers test for them selves because they often become our biggest supporters. Watch this video, which gives a pretty good overview of how Door Armor works and what it does. Thanks Bryan! Side Light Door security for doors with 2 sight lights. Side Light Door security for doors with one side light on the lock side of the door. Side Light Door security for doors with one side light on the hinge side of the door. Will This Fit My Door? - If you have a single entry door, a simple rule of thumb is that if you can fit two quarters between your door frame and door, when the door is closed, you will have no problem. If you can't fit two quarters, give us a call. What if I have Double Doors or Side Light Doors? - We have solutions for every kind of door. Just look under "Shop Now" and select your door type. Your discount works with everything on our site. What if I don't like the way it looks? - We're confident that you will like the way it looks but we have a 90-day no hassle return policy. So you can buy with confidence. What if Emergency Responders Need to Get In? 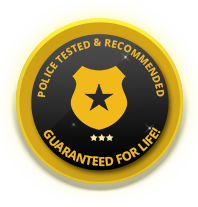 - They will get in... We have been very close to the police since founding this company in 2004. Emergency responders have ways to get in. And the door will open with a key so landlords and others shouldn't be concerned. © 2019 Armor Concepts LLC. All rights reserved.